It’s Valentine’s Day and, beloved retro fans, I would like to cordially invite you to an old school Food-of-Love spread. Oh, were we talking about food? Anne-Marie suggests using it today as an adult night cap, but it’s Valentine’s day and you’ve got to get the kids to sleep somehow. But if you don’t want to drug your children, perhaps you can share a family meal with them. Freya at Writing at the Kitchen Table cooked up a Retro Meatloaf . 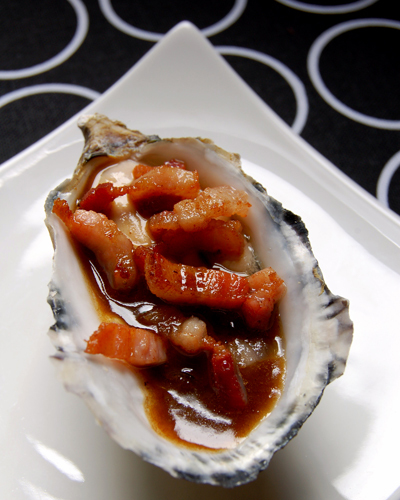 “Sure, it may seem about as romantic as Boston Baked Beans,” Freya writes, “but Paul [her honey] loves Meatloaf and what more romantic way to celebrate love than to cook your loved one food that they love?This is the ideal retro food photo. 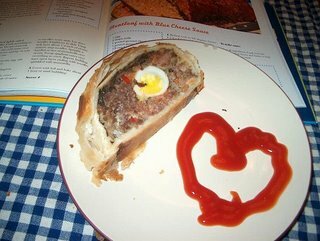 Patry wrapped meat, accented with a boiled egg and a ketchup heart! If you do decide to serve the kiddies liquored posset (and, honestly, that’s the best way to go) you and your beloved can enjoy Haalo’s aphrodisiac, Oysters Kilpatrick, all by yourselves. Now that dinner is out of the way, it’s time for sweets. 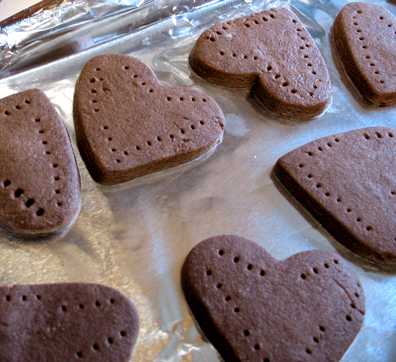 Elle at Feeding My Enthusiasms got her food processor going for these scrumptious Chocolate Shortbread Hearts. 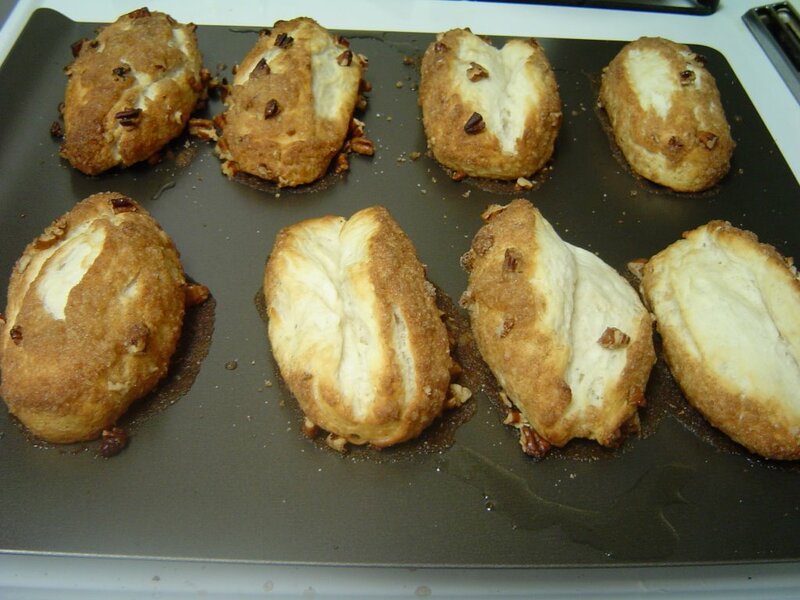 The recipe comes from the 1980 edition of Maida Heatter’s Book of Great Chocolate Desserts. 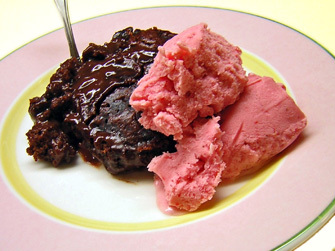 Brilynn from Jumbo Empanadas has her Valentine salivating with her grandmother’s recipe for Self-saucing Pudding Cake (served with Brilynn’s own Strawberry Ice Cream). 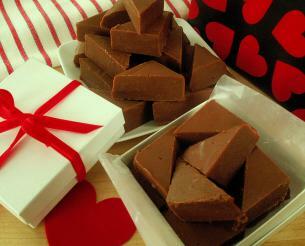 If you’re not in the mood for chocolate sweets, there’s still plenty of treats to choose from. 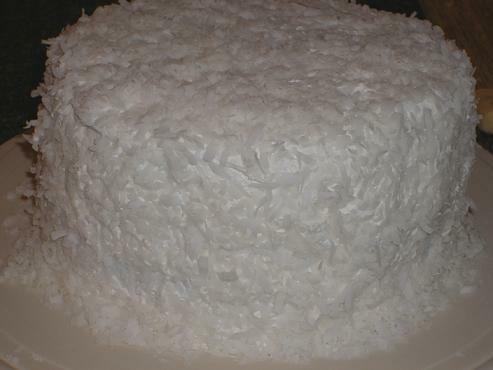 Breadchick from The Sour Dough took a break from kneading to bake up this Old Fashioned Coconut Cake from the McCall’s Cookbook Collection called Cook Your Way Into His Heart with Our Man-Tested Menus. 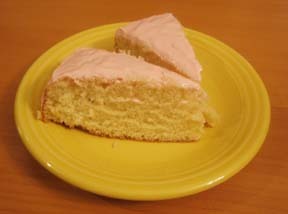 Holly at Craving Cleaveland baked up a One-Egg Cake from the 1910 cookbook (get this) Cupid at Home in the Kitchen. She gets an extra rose for attempting a recipe consisting on one sentence. Margaret at Kitchen Delights bested Betty Crocker AND Duncan Hines with her gorgeous St. Valentine’s Day Pavlova. 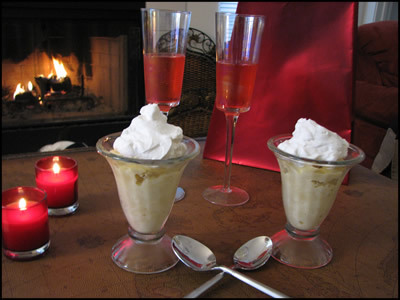 Finally, Jerry Russell at Cooking by the Seat of my Pants set a romantic scene with Tipsy Pudding. 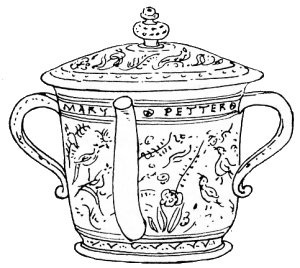 It comes from Fannie Farmer’s The Boston Cooking-School Cook Book, published in 1918, suggesting that Fannie was all about getting men drunk. And that’s it! Thank you to everyone who participated and have a very happy Valentine’s Day!